Whether you are using a public or custom model, MonkeyLearn is only going to show benefits when you bring it into your day to day process. We offer a number of ways for that to happen, both manually and automatically, but here we will focus on the automatic ways to have your text analyzed. It's one of our team's favorite ways to use MonkeyLearn on a daily basis, and for a number of different use cases, and without coding. Zapier makes it easy to build out multi step processes in a visual way and to have MonkeyLearn models enter at necessary points where text analysis will help determine the result of a workflow. For a series of example "Zaps", please see the MonkeyLearn page on Zapier. 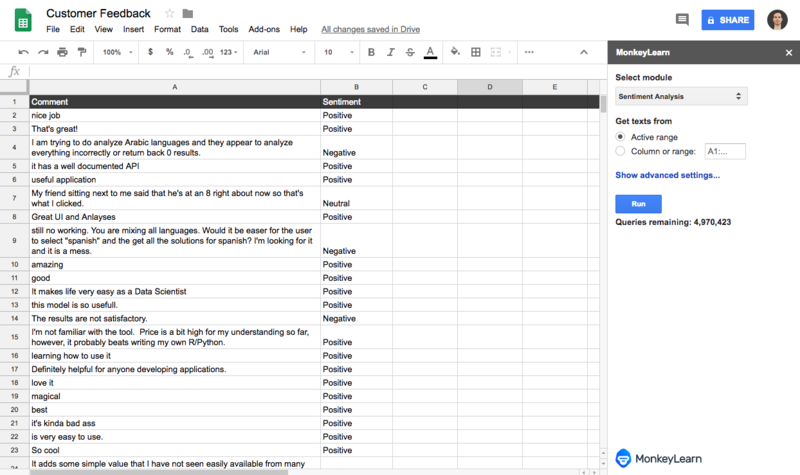 For those of us who have data stored in Google Sheets, you can easily add another column that will show predictions using a MonkeyLearn model. See the guide on installing the extension. RapidMiner is a tool that makes data science teams more productive. With this integration you can easily use MonkeyLearn as part of your RapidMiner pipeline. Check out our guide on installing the MonkeyLearn extension for RapidMiner.